The zesty sauce of After the Deadline is our language model. We use our language model to improve our spelling corrector, filter ill-fitting grammar checker suggestions, and even detect if you used the wrong word. It’s not hard to build a language model, but it can be time-consuming. Our binary model files have always been available through our GPL After the Deadline distribution. Today, as our gift to you, we’re releasing ASCII dumps of our language models under a creative commons attribution license. There is no over-priced consortium to join and you don’t need a university affiliation to get these files. This file contains each word token, a tab separator, and a count. There are 164,834 words from 76,932,676 occurrences. Our spell checker dictionary is made of words that occur two or more times in this list. This file is a dump of each two-word sequence that occurs in our corpus. It has 5,612,483 word pairs associated with a count. You can use this information to calculate the probability of a word given its next or previous words. This file has a limited set of trigrams (sequences of three words). Each trigram begins or ends with a word in our confusion set text file. You will need the information from the bigram corpus to construct trigram probabilities for these words. How I Trie to Capture Mistakes – The paper glosses over the use of a Trie to generate a pool of suggestions. There just wasn’t enough space to explain it. This blog post covers it in detail. Before we begin: Did you notice my fancy and SEO friendly post title? Linguists refer to misused words as real word errors. When I write about real word errors in this post, I’m really referring to the misused word detector in After the Deadline. One of my favorite features in After the Deadline is the real word error corrector. In this post, I’ll talk about this feature and how it works. I will also present an evaluation of this tool compared to Microsoft Word 2007 for Windows which has a similar feature, one they call a contextual spelling checker. After the Deadline has a list of 1,603 words it looks at. In this list, words are grouped into confusion sets. A confusion set is two or more words that may be misused during the act of writing. Some surprise me, for example I saw someone write portrait on Hacker News when they meant portray. The words portrait and portray are an example of a confusion set. Confusion sets are a band-aid and a limitation but they have their place for now. In an ideal program, the software would look at any word you use and try to decide if you meant some other word using various criteria at its disposal. After the Deadline doesn’t do this because it would mean storing more information about every word and how it’s used than my humble server could handle. Because of memory (and CPU constraints), I limit the words I check based on these fixed confusion sets. To detect real word errors, After the Deadline scans your document looking for any words in that potentially misused word list. When AtD encounters one of these words, it looks at the word’s confusion set and checks if any other word is a better fit. I’ll admit, the site does portrait credibility. The probability of a word given the previous two words is calculated using a trigram. When After the Deadline learns a language, it stores every sequence of two words it finds and sequences of three words that begin or end with a confusion set. To calculate the probability of a word given the next two words requires trigrams and a little algebra using Bayes’ Theorem. I wrote a post on language models earlier. To bring all this together, After the Deadline uses a neural network to combine these statistical features into one score between 0.0 and 1.0. The word with the highest score, wins. To bias against false positives, the current word is multiplied by 10 to make sure it wins in ambiguous cases. Ok, so the natural question is, how well does this work? Every time I rebuild After the Deadline, I run a series of tests that check the neural network scoring function and tell me how often it’s correct and how often it’s wrong. This kind of evaluation serves as a good unit test but it’s hard to approximate real word world performance from it. Fortunately, Dr. Jennifer Pedler’s PhD thesis has us covered. In her thesis she developed and evaluated techniques for detecting real word errors to help writers with dyslexia. Part of her research consisted of collecting writing samples from writer’s with dyslexia and annotating the errors along with the expected corrections. I took a look at her data and found that 97.8% of the 835 errors are real word errors. Perfect for an evaluation of a real word error corrector. Many things we consider the realm of the grammar checker are actually real word errors. Errors that involve the wrong verb tense (e.g., built and build), indefinite articles (a and an), and wrong determiners (the, their, etc.) are real word errors. You may ask, can real word error detection be applied to grammar checking? Yes, others are working on it. 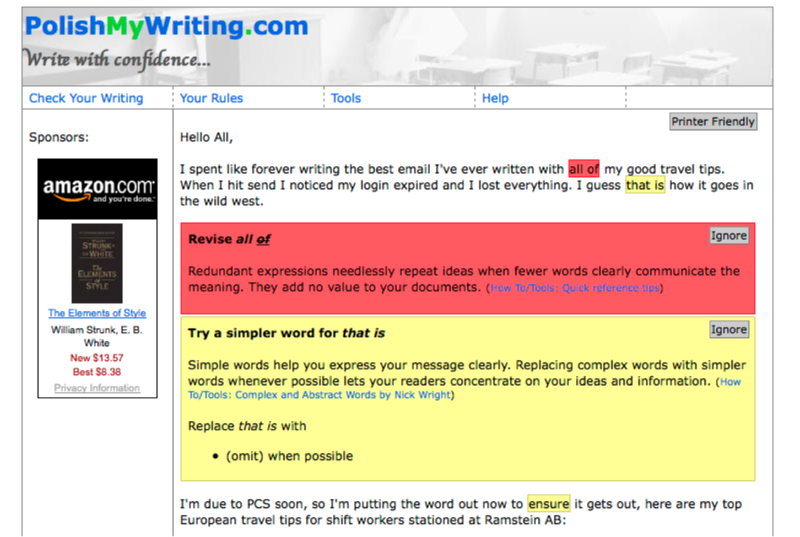 It makes sense to test how well After the Deadline as a complete system (grammar checker, misused word detector, etc.) performs correcting these errors. To test After the Deadline, I wrote a Sleep script to compare a corrected version of Dr. Pedler’s error corpus to the original corpus with errors. The software measures how many errors were found and changed to something (the recall) and how often these changes were correct (the precision). This test does not measure the number of elements outside the annotated errors that were changed correctly or incorrectly. Now we’re ready. Here are the numbers comparing After the Deadline to Microsoft Word 2007 on Windows, Microsoft Word 2008 on the Mac, and Apple’s Grammar and Spell checker built into MacOS X 10.6. I include Microsoft Word 2008 and the Apple software because neither of these have a contextual spell checker. They still correct some real word errors with grammar checking technology. As you can see, Microsoft Word 2007 on Windows performs well in the recall department. Every error in the dyslexic corpus that is not in After the Deadline’s confusion sets is an automatic hit against recall. Still, the precision for both systems are similar. You can try this experiment yourself. The code and data are available. I also created a page where you can paste in a document and accept all suggestions with one click. Another evaluation of MS Word 2007’s real-word error detection was published by Graeme Hirst, University of Toronto in 2008. He found that MS Word has lower recall on errors. To evaluate MS Word, he randomly inserted (1:200 words) real-word errors into the Wall Street Journal corpus, and then measured the system performance. It would be a benefit to the research community (especially *cough*those of us outside of universities*cough*) if such tests were conducted on data that one could redistribute. After running this experiment, I added the syntactically distinct words from Dr. Pedler’s confusion sets to AtD’s existing confusion sets, pushed the magical button to rebuild models, and reran these tests. I saw AtD’s recall rise to 33.9% with a precision of 86.6%. Expanding the confusion sets used in AtD will improve AtD’s real-word error correction performance. I’ll continue to work on expanding the number of confusion sets in After the Deadline. One challenge to whole-sale importing several words is that some words create more false positives than others when checked using the method described here (hence the precision drop when adding several unevaluated new words to the misused word detector). If you’re using Microsoft Word 2007 on Windows, you’re in good hands. Still, After the Deadline is comparable in the real-word error detection department when MS Word 2007 isn’t available. If you’re using a Mac, you should use After the Deadline. One of the challenges with most natural language processing tasks is getting data and collapsing it into a usable model. Prepping a large data set is hard enough. Once you’ve prepped it, you have to put it into a language model. My old NLP lab (consisting of two computers I paid $100 for from Cornell University), it took 18 hours to build my language models. You probably have better hardware than I did. I want to save you some pain and trouble if I can. That’s why I’m writing today’s blog post. Did you know After the Deadline has prebuilt bigram language models for English, German, Spanish, French, Italian, Polish, Indonesian, Russian, Dutch, and Portuguese? That’s 10 languages! Also, did you know that the After the Deadline language model is a simple serialized Java object. In fact, the only dependency to use it is one Java class. Now that I’ve got you excited, let’s ask… what can you do with a language model? A bigram language model has the count of every sequence of two words seen in a collection of text. From this information you can calculate all kinds of interesting things. As an administrative note, I will use the Sleep programming language for these examples. This code is trivial to port to Java but I’m on an airplane and too lazy to whip out the compiler. Let’s load up the Sleep interactive interpreter and load the English language model. You may assume all these commands are executed from the top-level directory of the After the Deadline source code distribution. And there you have it. A language model ready for your use. I’ll walk you through each API method. The count method returns the number of times the specified word was seen. The Pword method returns the probability of a word. The Java way to call this is model.Pword(“word”). That’s the simple stuff. The fun part of the language model comes in when you can look at context. Imagine the sentence: “I want to bee an actor”. With the language model we can compare the fit of the word bee with the fit of the word be given the context. The contextual probability functions let you do that. This method calculates P(word|previous) or the probability of the specified word given the previous word. This is the most straight forward application of our bigram language model. After all, we have every count of “previous word” that was seen in the corpus we trained with. We simply divide this by the count of previous to arrive at an answer. Here we use our contextual probability to look at be vs. bee. If you were a computer, which word would you assume the writer meant? These methods will also accept a sequence of two words in the parameter that you’re calculating the probability of. I use this trick to segment a misspelled word with a space between each pair of letters and compare the results to the other spelling suggestions. You’ll notice 0END.0. This is a special word. It represents the end of a sentence. 0BEGIN.0 represents the beginning of a sentence. The only punctuation tracked by these models is the ','. You can refer to it directly. This command harvests all words that occur a million or more times. As you can see, there aren’t too many. The language model I have now was derived 75 million words of text. That’s the After the Deadline language model in a nutshell. There is also a method to get the probability of a word given the two words that came before it. This is done using trigrams. I didn’t write about it here because AtD stores trigrams for words tracked by the misused word detector only. That said, there’s a lot of fun you can have with this kind of data. Download the After the Deadline open source distribution. You’ll find the English language model at models/model.bin. You can also get spellutils.jar from the lib directory. If you want to experiment with bigrams in other languages, the After the Deadline language pack has the trained language models for nine other languages. The English language model was trained from many sources including Project Gutenberg and Wikipedia. The other language models were trained from their respective Wikipedia dumps. After the Deadline is an open source grammar, style, and spell checker. Unlike other tools, it uses context to make smart suggestions for errors. Plugins are available for Firefox, WordPress, and others. Spell checkers have a bad rap because they give poor suggestions, don’t catch real word errors, and usually have out of date dictionaries. With After the Deadline I’ve made progress on these three problems. The poor suggestions problem is solved by looking at context as AtD’s contextual spell checker does. AtD again uses context to help detect real word errors. It’s not flawless but it’s not bad either. AtD has also made progress on the dictionary front by querying multiple data sources (e.g., Wikipedia) to find missing words. So despite this greatness, contextual spell checking isn’t very common. I believe this is because contextual spell checking requires a language model. Language models keep track of every sequence of two words seen in a large corpus of text. From this data the spell checker can calculate P(currentWord|previousWord) and P(currentWord|nextWord). For a client side application, this information amounts to a lot of memory or disk space. Is it possible to deliver the benefits of a contextual spell checker in a smaller package? Why would someone want to do this? If this could be done, then it’d be possible to embed the tiny contextual spell checker into programs like Firefox, OpenOffice, and others. Spell check as you type would be easy and responsive as the client could download the library and execute everything client side. I believe it’s possible to reduce the accuracy of the language model without greatly impacting its benefits. Context makes a difference when spell checking (because it’s extra information), but I think the mere idea that “this word occurs in this context a lot more than this other one” is enough information to help the spell checker. Usually the spell checker is making a choice between 3-6 words anyways. One way to store low fidelity language model information is to associate each word with some number of bloom filters. Each bloom filter would represent a band of probabilities. 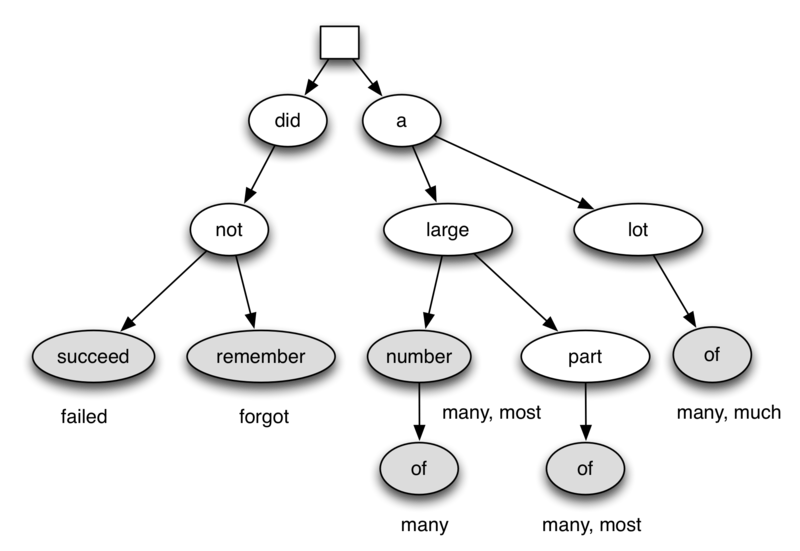 For example a word could have three bloom filters associated with it to keep track of words occurring in the top-25%, middle-50%, and bottom-25%. This means the data size for the spell checker will be N*|dictionary| but this is better than having a language model that trends towards a size of |dictionary|^2. A bloom filter is a data structure for tracking whether something belongs to a set or not. They’re very small and the trade-off is they may give false positives but they won’t give false negatives. It’s also easy to calculate the false positive rate in a bloom filter given the number of set entries expected, the bloom filter size, and the number of hash functions used. To optimize for space, the size of the bloom filter for each band and word could be determined from the language model. If this technique works for spelling, could it also work for misused word detection? Imagine tracking trigrams (sequences of three words) for each potentially misused word using a bloom filter. After looking further into this, it looks like others have attacked the problem of using bloom filters to represent a language model. This makes the approach even more interesting now. I’m often asked if AtD gets smarter the more it’s used. The answer is not yet. To stimulate the imagination and give an idea of what’s coming, this post presents some ideas about how AtD can learn the more you use it. There are two immediate sources I can harvest: the text you send and the phrases you ignore. The text you send is an opportunity for AtD to learn from the exact type of writing that is being checked. The process would consist of saving parts of submitted documents that pass some correctness filter and retrieving these for use in the AtD language model later. Submitted documents can be added directly to the AtD training corpus which will impact almost all features positively. AtD uses statistical information from the training data to find the best spelling suggestions, detect misused words, and find exceptions to the style and grammar rules. More data will let me create a spell checker dictionary with less misspelled or irrelevant words. A larger training corpus means more words to derive a spell checker dictionary from. AtD’s spell check requires a word is seen a certain number of times before it’s included in the spell checker dictionary. With enough automatically obtained data, AtD can find the highest threshold that will result in a dictionary about 120K words. When you click “Ignore Always”, this preference is saved to a database. I have access to this information for the WordPress.com users and went through it once to see what I could learn. This information could be used to find new words to add to AtD. Any word that is ignored by multiple people may be a correct spelling that the AtD dictionary is missing. I can set a threshold of how many times a word must be ignored before it’s added to the AtD word lists. This is a tough problem though as I don’t want commonly ignored errors like ‘alot’ finding their way into the AtD dictionary, some protection against this is necessary. Misused words that are flagged as ignored represent an opportunity to focus data collection efforts on that word. This is tougher but I may be able to query a service like wordnik to get more context on the word and add the extra context to the AtD corpus. If a word passes a threshold of being ignored by a lot of people, it may also be a good idea to consider removing it from the misused word list automatically. The statistical detection approach doesn’t work well with some words. These ideas represent some of the low hanging fruit to make AtD learn as you use the service. Let’s imagine I could make AtD could track any behavior and the context around it. There are good learning opportunities when you accept a suggestion and the misused word feature has more opportunity to improve if context is attached to your accepting or ignoring a suggestion.